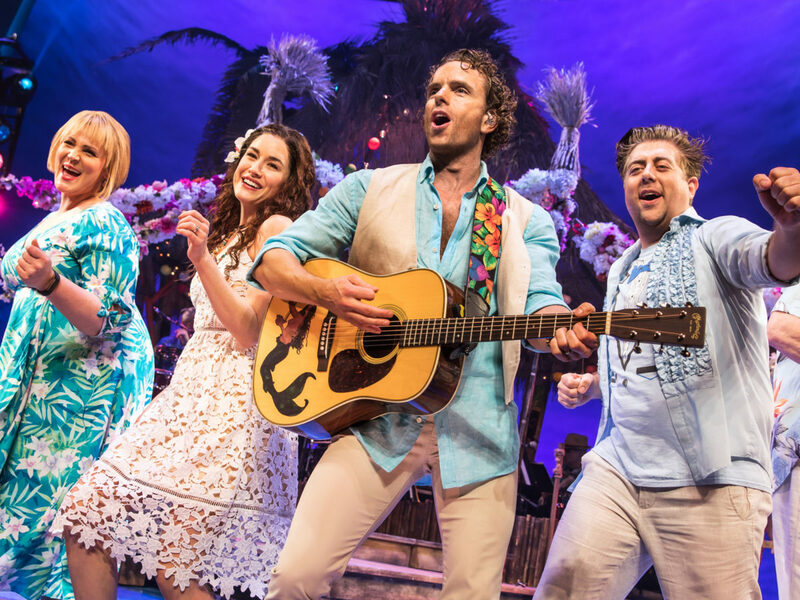 Lisa Howard as Tammy, Alison Luff as Rache, Paul Alexander Nolan as Tully and Eric Petersen as Brick in “Escape to Margaritaville”. Lisa Howard as Tammy. As versatile and talented as she is beautiful, Howard’s depiction of Tammy’s slow build to self-acceptance and understanding is sweet and unwavering. Whether she is flying through the air in “Cheeseburger in Paradise” or imagining that it is “Five O’Clock Somewhere,” Howard’s stage presence is refreshing and vibrant. Slow burns and big reveals. Punch lines may take up to an hour before making their marks, but they’re well-worth the wait. Seemingly irrelevant plot points are genuine fun when they finally jive with the rest of the story. Wondering why J.D. (Don Sparks) is constantly looking for his lost salt shaker? Only true “Margaritaville” fans may have a notion as to why. A tropical retreat in Midtown. 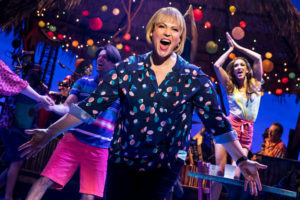 Audiences can’t help but enjoy the beach balls, Adirondack chairs, paper umbrellas and overpriced margaritas welcoming them to the transformed Marquis Theatre. Not to mention, guests attend in appropriate attire; just try not to count the Hawaiian shirts dotting the large space. A veritable treasure in our beloved lipstick jungle, the venue is a relaxing “escape” from the norm. Cultish kitsch. Dancing clouds? Befuddling musical numbers based around dead hallucinated accountants? A tap number led by the talented Eric Peterson…in which he doesn’t actually tap? Snorkeling in mid-air? 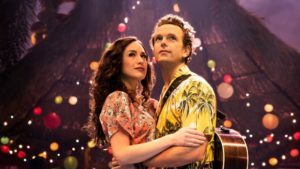 It’s all weird and remarkably groan-worthy, but these are many of the aspects that make Margaritaville so much fun to hate.